Medium size (36 mm) stainless steel case with 7 mobile diamonds, white dial, quartz movement with hours, minutes, seconds, and date, blue leather strap. Water resistant to 30 meters. Medium size (36 mm) stainless steel case with 3 mobile diamonds, diamond bezel, white dial, quartz movement with hours, minutes, seconds, and date, white rubber strap. Water resistant to 30 meters. Medium size (36 mm) stainless steel case with 7 mobile diamonds, diamond bezel, mother of pearl Mickey Mouse dial, quartz movement with hours, minutes, and seconds, black fabric strap. Water resistant to 30 meters. 36mm stainless steel case, stainless steel crown, diamond bezel, white dial with moving diamonds, quartz movement with hours, minutes, seconds and date, black alligator strap, stainless steel pin buckle. Water resistant to 30 meters. 36mm stainless steel case, stainless steel crown, blue dial with gem-set clown fish, quartz movement, blue brushed glossy fabric strap, stainless steel pin buckle. Water resistant to 30 meters. Medium size (36 mm) stainless steel case 7 moving diamonds, 18K white gold diamond bezel, white dial, quartz movement with date at 4 o'clock, leather strap. Water resistant to 30 meters. 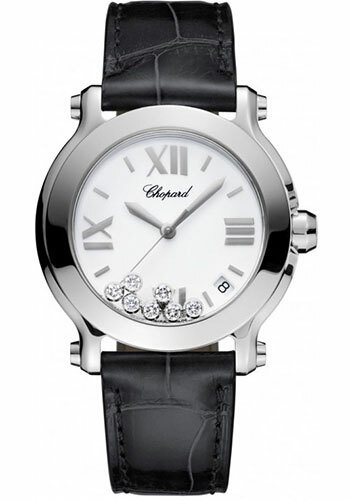 Medium size (36 mm) stainless steel case 7 moving diamonds, black dial, quartz movement with date at 4 o'clock, stainless steel bracelet. Water resistant to 30 meters. 36mm stainless steel case, stainless steel crown, diamond bezel, white dial with moving diamonds, quartz movement with hours, minutes, seconds and date, stainless steel bracelet, stainless steel folding buckle. Water resistant to 30 meters. 36mm stainless steel case, stainless steel crown, white lacquered bezel with Roman numerals, silver toned engine turned dial, quartz movement with hours, minutes, seconds and date, white rubber strap, stainless steel pin buckle. Water resistant to 30 meters. 36mm stainless steel case, stainless steel crown, black lacquered bezel with Roman numerals, black engine turned dial with moving diamonds, quartz movement with hours, minutes, seconds and date, black rubber strap, stainless steel pin buckle. Water resistant to 30 meters. 36mm stainless steel case, stainless steel crown, diamond bezel with Roman numerals, silver toned engine turned dial with moving diamonds, quartz movement with hours, minutes, seconds and date, white rubber strap, stainless steel pin buckle. Water resistant to 30 meters. 36mm stainless steel case, stainless steel crown, diamond bezel, black engine turned dial with moving diamonds, quartz movement with hours, minutes, seconds and date, black rubber strap, stainless steel pin buckle. Water resistant to 30 meters.